At this year’s Dell Annual Analyst Conference (DAAC), Michael Dell was crystal clear about the immense opportunity the Internet of Things (IoT) represents. In fact, he called it the trillion dollar opportunity. Not surprisingly, IoT was one of the big trending topics also discussed by analysts, sourcing advisors, Dell partners and customers alike. It was reflected in keynote speeches, breakout sessions and in demos. The building automation demo by Dell OEM partner KMC Controls showcased how data taken from sensors in a building, aggregated via a gateway and then analyzed can help make a building more energy efficient and safer. 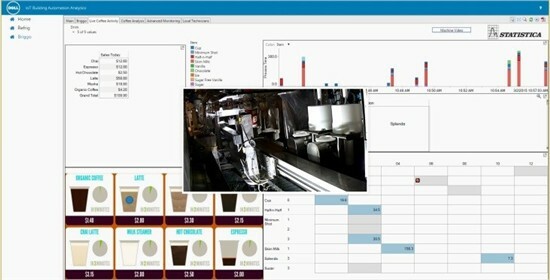 Next to this demo, Dell Software showed how an advanced analytics solution built on top of the KMC Controls solution can provide comprehensive data integration and predictive analytics-based insights. Let’s step back a bit. IoT is not new and although it is often framed as an emerging trend, it is no longer a prospect of the future. 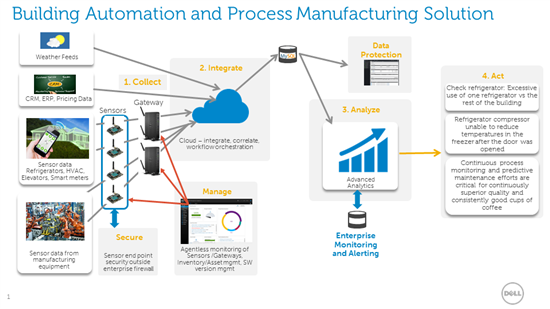 Many companies already have sensors on their equipment used for predictive maintenance. The Internet of Things can be described as an ecosystem where sensors, devices and equipment are connected to a network, and can transmit and receive data for tracking, analyzing, and taking business actions. What does this data journey look like? The journey of the data begins at the sensor connected to a device, for example an air conditioning unit or refrigerator. Now the data has to travel via a wireless or connected medium to get to an aggregation point, either a gateway or a datacenter. Gateways, such as the just launched Dell IoT Gateway , are small, wireless or connected devices that collect, help secure and process sensor data at the edge of a network. They represent one way of collecting data and can be used as a smart device to perform real-time monitoring and analytics of streaming data. Nicely integrated, this data is now ready for analytics (Dell Statistica). This video explains the value proposition. In short, here is how it works: There are two ways to analyze the data: 1. perform real-time analytics on streaming data (time series, see examples 1 and 2 below) at the edge (gateway) and 2. perform deeper analytics on the historic data set that can be done in the datacenter to help predict maintenance events or forecast business trends. An example of streaming data analytics is shown in figures 1 and 2. Figure 1 (follow link) shows the monitoring of refrigerator compressor temperature against ambient temperature in real time, setting off alerts to the building operator in case of anomalies, such as an unhealthy compressor. Figure 2 (also shown above) shows real-time operational analytics mashing coffee pricing data (milk, paper cup, coffee grounds, etc.) with sensor data from inside the manufacturing facility to monitor the overall health of the manufacturing facility. Figure 3 (follow link) provides an example of predictive analytics performed on data at rest. This example shows how we can use multivariate process monitoring and control statistics to predict machine health. The analytics show that there is a definite correlation between the speed of the cup movement by the robotic arm inside the coffee machine and the ice dispensing speed which points to the need for maintenance of the robotic arm. KMC Controls, via its building automation solution, controls and monitors the devices and sensors that are installed in a building. There is an opportunity to develop a centralized view of the entire building to provide a comprehensive IT management solution which includes IoT devices and sensors as well as all IT assets that are managed inside the building. Many devices work on their own secure network, and building automation manufacturers like KMC Controls need to consider what security measures must be implemented for detecting and blocking malicious activity over non-standard network protocols. A natural starting point is to consider extending the existing firewall technologies to comprehend these new devices. To assist companies in overcoming the hurdles in setting up industrial IoT technologies, Dell has set up the Dell Internet of Things (IoT) Lab. Companies can come to the lab – located in the Dell Silicon Valley Solution Center in Santa Clara, CA – to receive assistance in architecting solutions to their IoT needs.